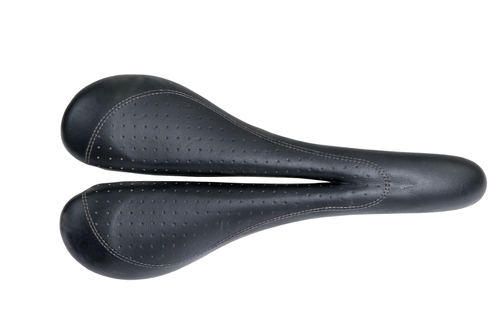 I don't think I'm the only cyclist who hasn't found the perfect saddle. I've tried several and they all seem similar... not especially comfortable. I was speaking to a friend who heard a presentation by a urologist about the best seat designs. He was shocked to have heard the split seat we see so much of may not be the one we need. The doctor's opinion was the design actually put too much pressure on the wrong places. I started to read and found opinions and designs all over the place. There may not be one answer. Some people ride split seats perfectly well and others swear by the traditional seat design, like the Brooks, Fisik and others. There seem to be studies supporting both. Intuitively the split design looks like it would be best anatomically. When I bought my last bike it came with a split design and I never even considered anything else. Sound familiar? First, there is a lot of agreement on selecting a seat wide enough that your seated weight is on your sit bones. Second, the perineal cutouts may not do what you expect. That means many traditional saddles may work best. Third, raising your handle bars for a more erect seated position reduces the pressure. Fourth, stand on the pedals for 15 seconds every ten minutes to increase blood flow. Finally, do your research, saddles with a short nose, a long nose, or no nose and a slightly downward position may do the trick for you. Please, we don't have to ride in pain, numbness or concern over doing real harm.